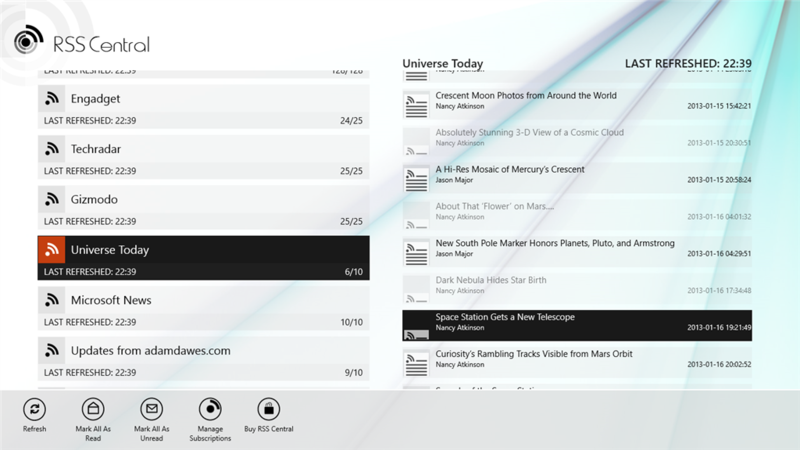 RSS Central is a powerful and easy to use application that can download and display RSS, Atom and RDF news feeds from web sites all over the internet. Its quick multi-download system will bring all the news feeds you want to your fingertips in no time, and will hold on to them so that they can be read even if you lose your internet connection. RSS Central features an attractive and informative user interface, a feed search to discover new news sources, article summary and full web page displays, article search tools, a live tile with article spotlights, read/unread article tracking, support for international characters, article sharing and emailing support, portrait and landscape support, plus a whole lot more. 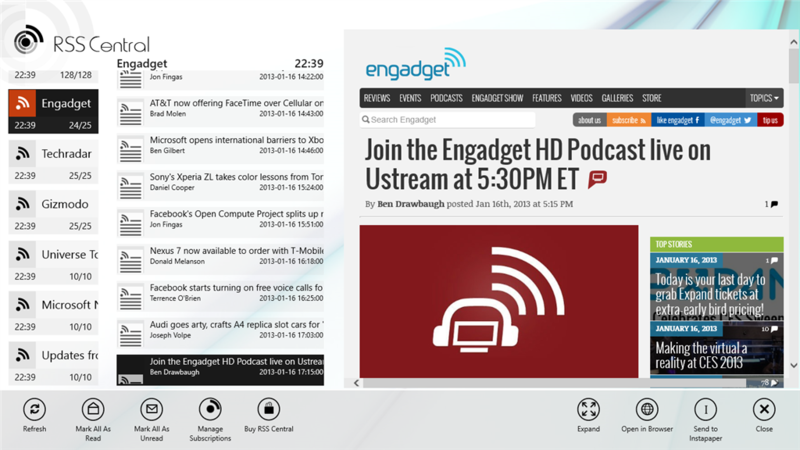 RSS Central's trial mode is fully featured, and just displays occasional "nag" screens while using the application. Please give it a try and see what you think. The Windows version of RSS Central is based upon my Windows Phone version which has been received with overwhelmingly positive reviews. 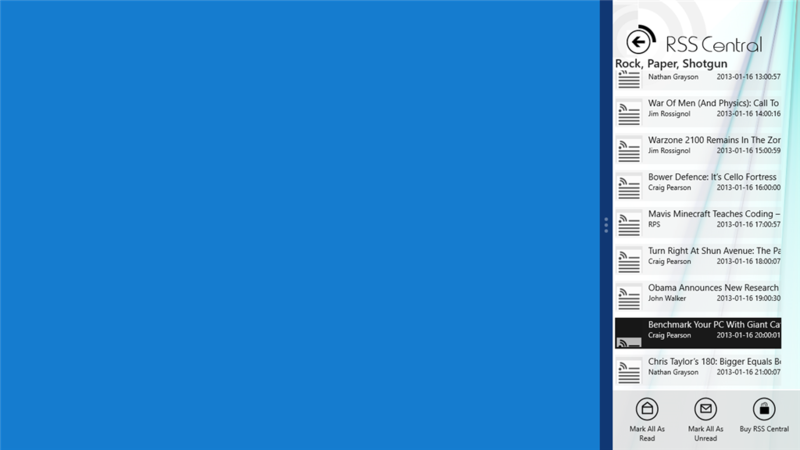 The Windows version has an entirely new design and layout, with all new graphics and a completely reconsidered navigation model to take advantage of the larger screen size. 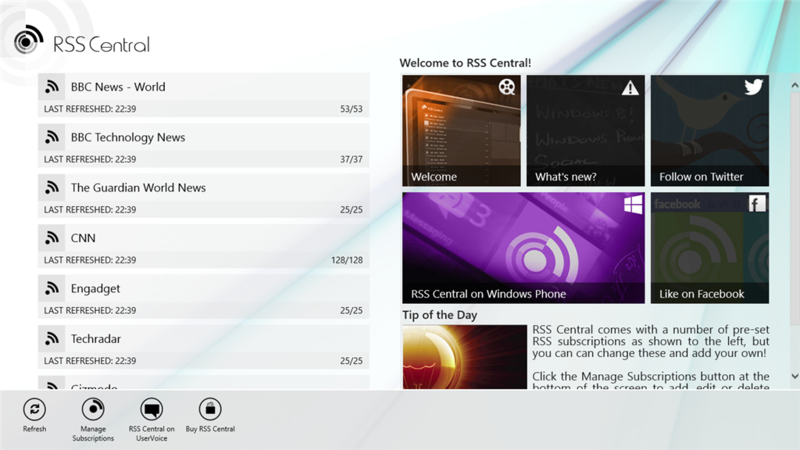 I am confident that you'll find RSS Central to be a quick and powerful way to access your news feeds! I intend to continue developing and enhancing RSS Central, so if you have any comments, suggestions, complaints or bug reports, please add them to RSS Central's UserVoice page or contact me and let me know. Attractive and functional Windows-style user interface. Streamlined navigation to make using the app as quick and easy as possible. Fast application startup to get you straight into your feeds without having to wait. Feed search function to help you discover new feeds and news sources. Display the full article pages or a quick article summary -- the summary is available even if you have no internet connection. 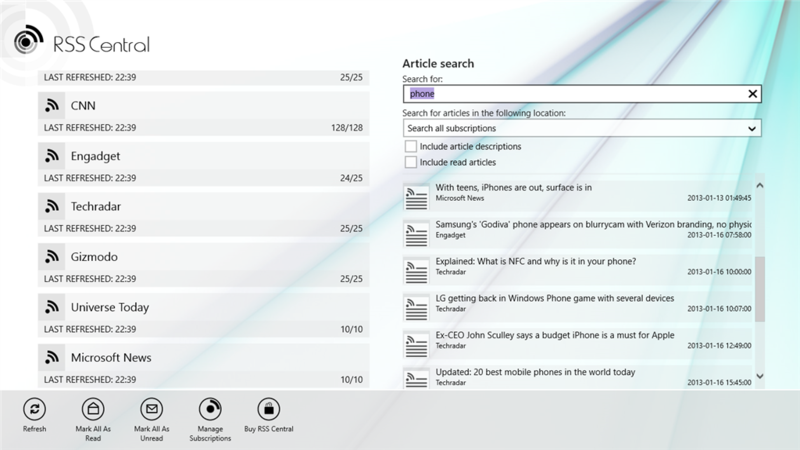 Live tile shows the number of unread articles and a selection of recent article headlines. Share articles with your social networking apps or send them by email. Search for keywords within feeds to help you find articles of interest. Import and export your subscriptions in .opml format from your computer, or via SkyDrive or Dropbox. "Minimum refresh time" prevents unnecessary re-downloading of unchanged feeds. Automatic tracking of read and unread articles. Choose to hide read articles and read subsciptions if you wish. Full support for international character sets. Send article details to your Instapaper account. Full support for portrait and landscape orientation, and for working in "snapped" mode. RSS Central for Windows Phone The Windows Phone version of RSS Central. DigiLocker DigiLocker, the home of Jonny Shaw (who provided the fantastic graphics and videos for RSS Central -- thanks Jonny!). Added support for importing and exporting .OPML files from and to the local file system. 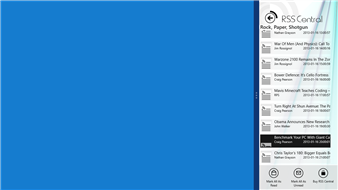 Added support for importing and exporting .OPML files via your SkyDrive account. 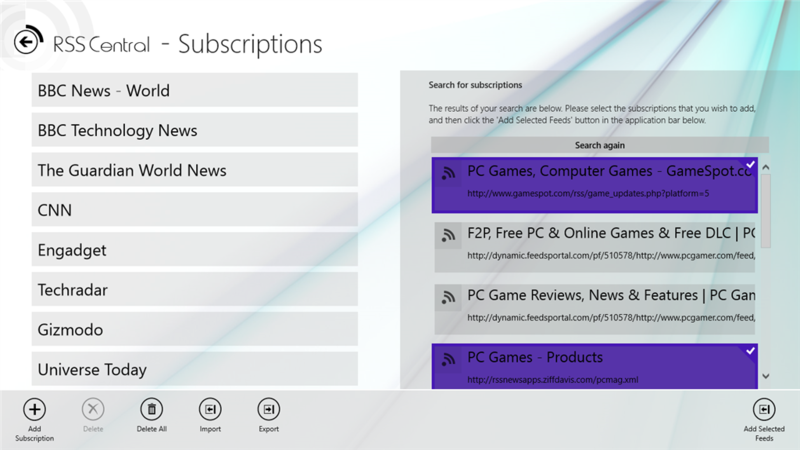 Added a Category filter to the subscriptions list to help find just the subscription you are interested in. Fixed the subscription feed search function. Added next/previous article buttons when in "expanded" or "snapped" modes. Added an internal subscription list backup function to protect against the list being damaged or corrupted. Various minor feed compatibility improvements..